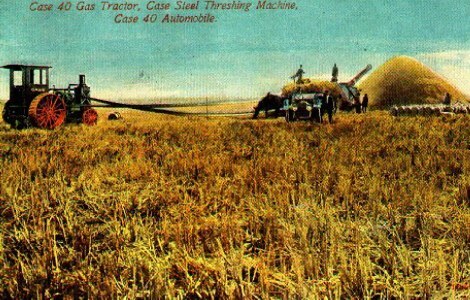 I've collected a few antique postcards from the teen's that were used by many tractor manufactures. 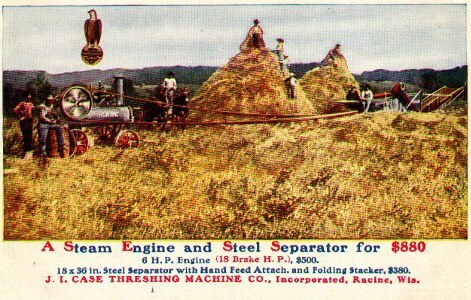 These postcards would have been given out at plowing demonstrations, fairs and dealerships to advertise their machinery doing various tasks. These are two postcards from the M. Rumely Co. of La Porte, Indiana. The first one is a 15-30F Oil Pull Kerosene Tractor. 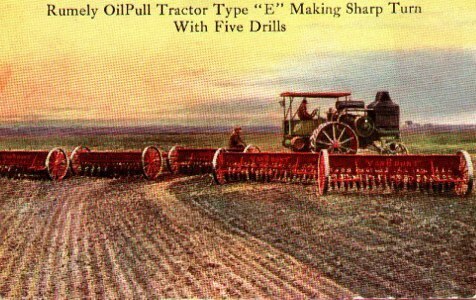 The 15-30 had a single cylinder engine, while the 30-60E, pictured in the second photo pulling an eight bottom plow, had a two cylinder engine. The title on this postcard say's it all. This may have been a sharp turn but it still looks like it took a couple of acres. 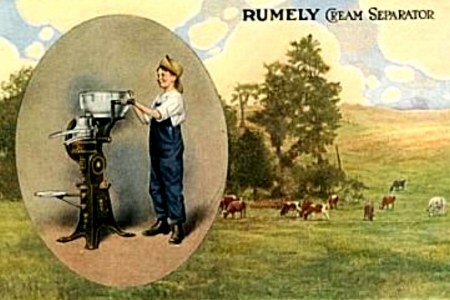 Rumely also manufactured cream separators as represented in this postcard. 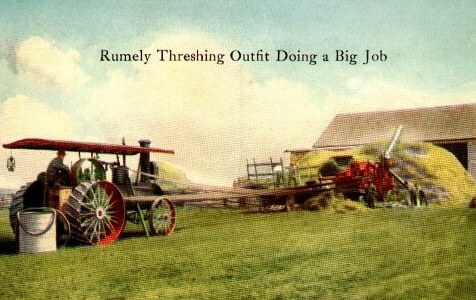 The postcard above is a Rumely steam traction engine powering a threshing machine. 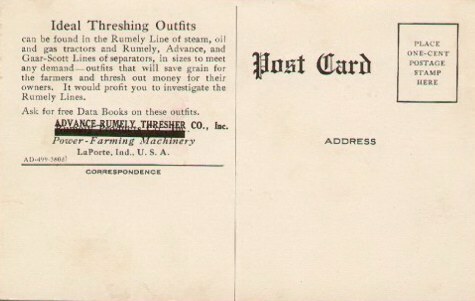 An unusual feature of this card is that on the reverse side, where the description of the machinery is, the Rumely Products Co. has been crossed out and Advance-Rumely Thresher Co. has been inserted. 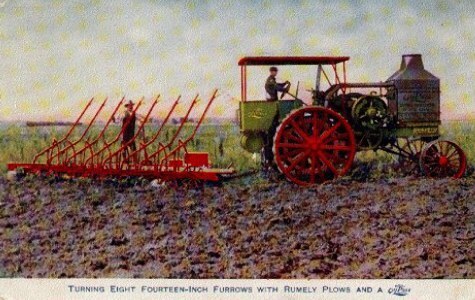 This means that this card was left over from before the Rumely Products Co. was reorganized as the Advance Rumely Co.
Rumely bought out many other companies including the Watts Corn Sheller Co. and Olds Gas Engine Co. Shown in the first picture. 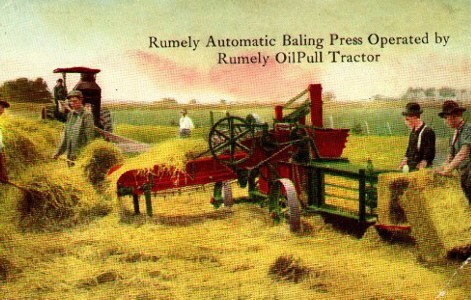 The second picture is of a Rumely baling press being operated by an Oil Pull. 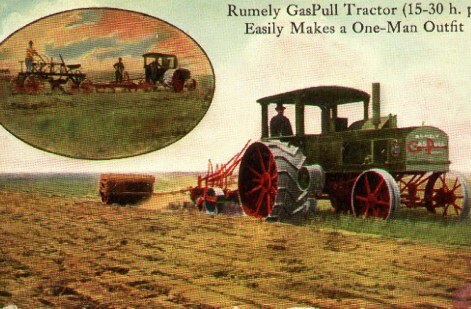 These advertising postcards are for the Rumely Toe Hold and Gas Pull tractors. 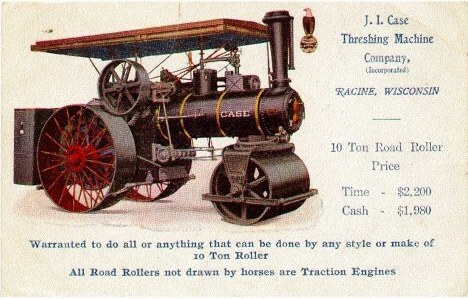 The Toe Hold had 14 tractive horsepower and 32 horsepower for belt work. 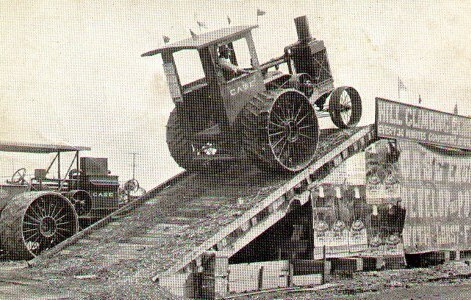 Rumely boasted that it was light-weight, speedy, turns short, burns cheap fuel and less than five feet high. 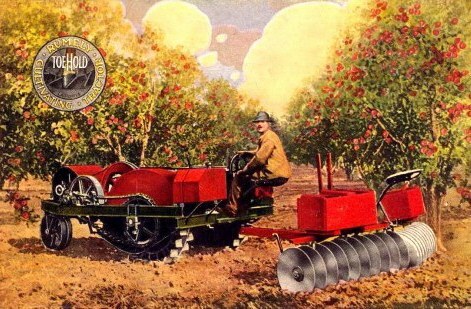 As far as I know their are not any of these tractors still in existence. 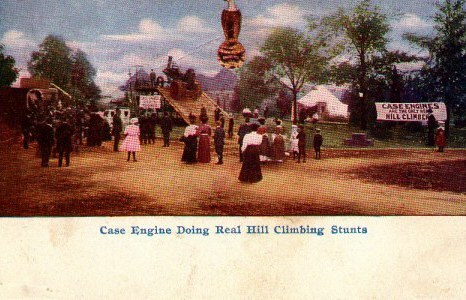 The Gas Pull in the second postcard had a two cylinder opposed engine. 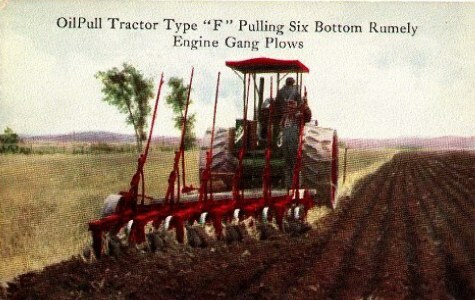 The first postcard is of a Big Four "30" pulling an eight bottom plow . 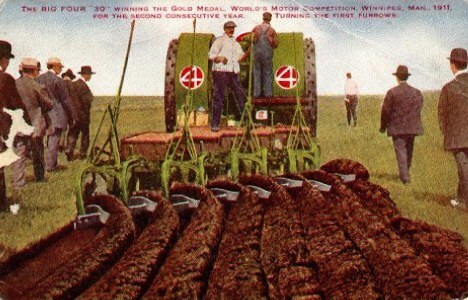 The card reads: The Big Four "30" winning the Gold Medal, World's Motor Competition, Winnipeg Man., 1911. For the second consecutive year. The second postcard is also of a Big Four "30". 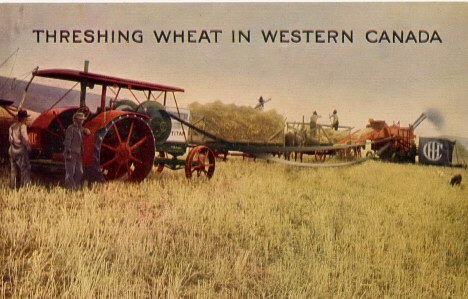 Here the tractor is being used to thresh wheat. 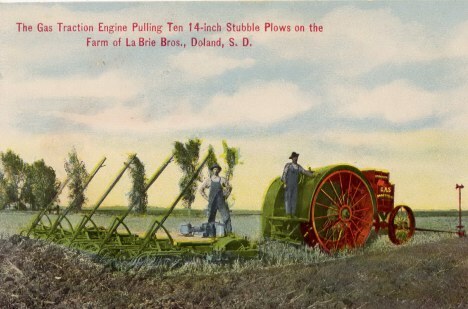 This postcard is of the Gas Traction engine pulling ten 14-inch stubble plows on the farm of La Brie Bros., Doland S.D.. Note the furrough guide in front of the tractor. Here are a pair of postcards for the J. I. Case Steam roller available for $1,980 cash. These two cards are by the J.I. Case Company. 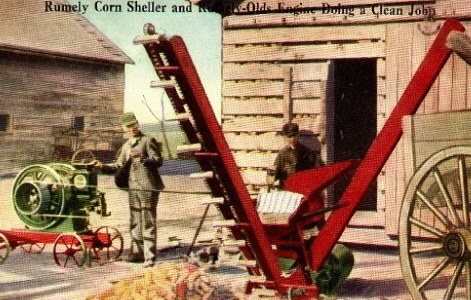 They show the 20-40 Gas Tractor threshing in the first one and a portable steam engine threshing in the second. 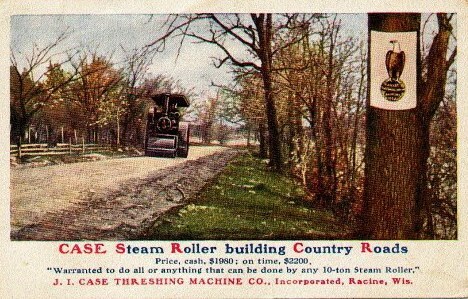 The car in the first card is also built by Case. 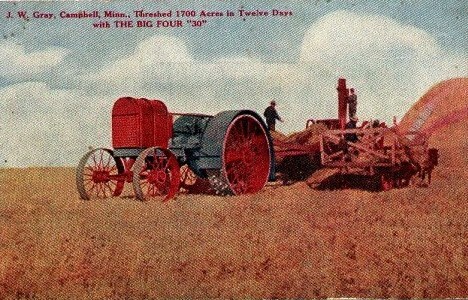 This is a postcard of an International Harvester Titan tractor threshing wheat.